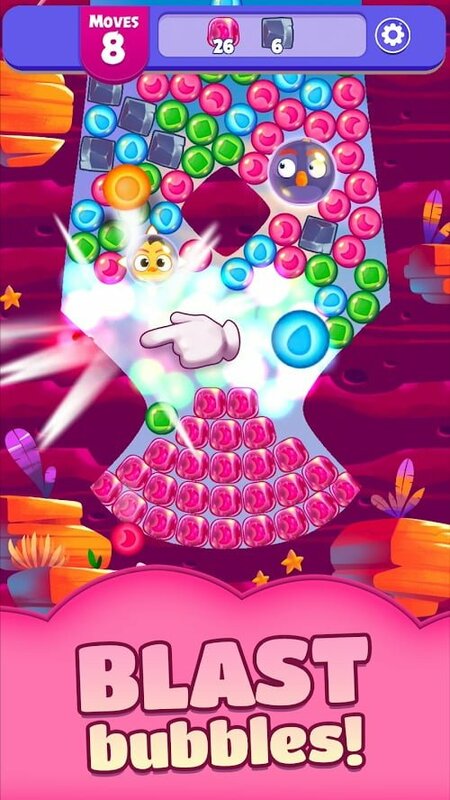 Home / Games / Angry Birds Dream Blast: Play new bubble puzzles! Should we use Angry Birds Dream Blast MOD APK? Dreamy Beak, Sleepy Blastonaut, or Joyful Snout? 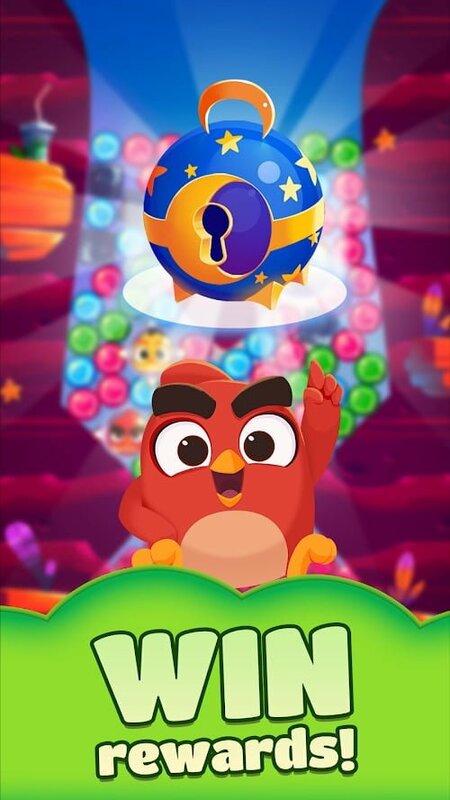 The function of randomly creating lovely names at the beginning of Angry Birds Dream Blast immediately makes you feel the joyful atmosphere of this gentle puzzle game. The game also brings a feeling of joy and attraction that made the name of the Rovio developer. You will explode colorful strings of bubbles to clear all bubbles on the screen or meet interesting and varied goals. However, it is not the game that you can win with clicking randomly. Instead of racing with a countdown timer, you will be given a limited number of moves, and this number is constantly decreasing. So, it is wise to slow down a bit and look closely at the screen to find the biggest bubble beam or the longest bubble sequence. Of course, you will gradually unlock more special skills. Please note that you must save them and only use them at the right time. Of course, angry birds also play an important role in the game. They appear in small bubbles. When the bubble explodes, you will remove either the entire row or the shadow of the screen. If you are really smart, you will blow the bubbles that are separating the birds, then push them into the same bubble to create double strength. The experience of activating and combining these special moves with great devastating power brings tremendous satisfaction, especially when the bubbles bounce continuously like a child who is eager for birthday parties. Besides, each level has additional special missions. For example, help the egg fall to the ground or destroy the blue pig. The best way to accomplish this is to create Angry Birds – birds that can create explosions that destroy surrounding bubbles. Combining multiple bubbles (more than 3) of the same color will create a red Angry Bird, touch to create a small explosion. Combine two red Angry Birds to create a yellow Angry Birds, touch to create a big explosion. 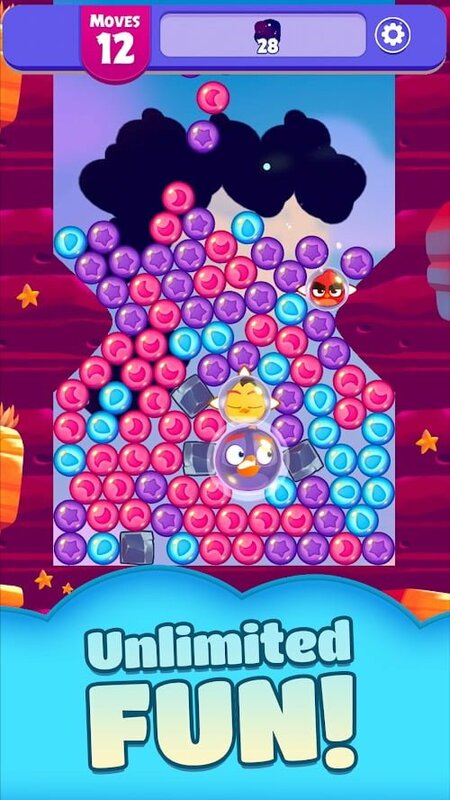 Purple Angry Birds is created when two yellow Angry Birds are close together, it can help you clean up all the bubbles on the screen. After playing to level 35, I began to feel that things got tougher. I have to play many times to overcome the challenges of the game. In the official version, you are only allowed to play certain times a day. After you use up the number of plays (life), you have to wait or buy it in cash. In this case, Angry Birds Dream Blast MOD APK can help you. Our MOD version gives you unlimited lives, you can play as many times as you like. Besides, the game also gives you the number of infinite coins to buy the power-up. In Dream Blast’s world, we are Shiny Dreamer, the bubble explorer, the one who combines the bubbles with great destructive power, and who also possesses superpowers. Thanks to this game, our daily boring moments become more interesting. Angry Birds Dream Blast MOD APK is ready to download! Depending on your needs, you can download Angry Birds Dream Blast MOD APK or Angry Birds Dream Blast Original APK. Or install from Google Play / App Store if you want.